Lg La Grande Leon Gto Radio en Vivo . Also know as XHELG FM is a radio station on 95.5 FM in León, Guanajuato. 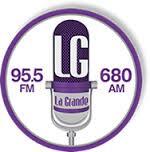 It is owned by Promomedios and carries a Spanish oldies format known as LG La Grande.